The Société Française pour l’Etude des Lipides (SFEL) recently held the fourth iteration of their Lipids and Brain conference in Nancy France. I was given the opportunity to present some preliminary results from an ongoing study I am conducting as part of my PhD, looking into the effects of a multi-nutrient omega-3 fatty acid supplement and exercise on mobility and cognitive function in ladies aged 60+. Analysis of the baseline data revealed relationships between levels of omega-3 fatty acids in the blood with cognitive and gait outcomes, however this effect differed between non-frail and pre-frail participants. 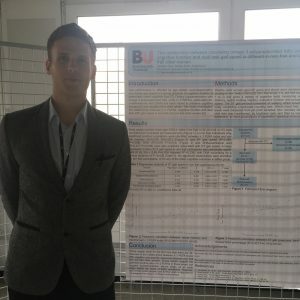 The conference brought together scientists, physicians and nutritionists to provide a unique prospective on the role of lipid nutrition in the prevention and treatment of neurodegenerative diseases with a large focus on Alzheimer’s Disease (AD). The conference was a mix of lectures, invited reviews, and poster sessions. There was a tremendous variety of topics presented, including lectures on the pathophysiology and epidemiology of AD, how AD can impact lipid metabolism and the effects of lipid intake on prevention and treatment of AD. During the conference Professor Stephen Cunnane from the Research Center on Aging, Sherbrooke (Canada) was presented with the prestigious Chevreul Medal. On a personal note this was an exciting opportunity for me to present my work and represent Bournemouth University and my supervisory team of Dr. Simon Dyall and Dr. Fotini Tsofliou at a respected conference. It was very satisfying to see some interest in my work from researchers whose work I myself look up to. I would like to extend my gratitude towards Bournemouth University, for providing the funding that allowed me to attend the conference and to the scientific committee at the SFEL for organising such an impeccable event.